Michael J. Rosen is a spectacular storyteller. Without even looking at the illustrations, every movement, every feeling, was set before me with his words. This is a deeply moving story told in third person, of a cattle dog and how it saved a whole family from dying in the snow. It wasn’t a rescue mission as such. It was a response to a whistle, a return of a herd. The dog did what he was trained to do: he sought out and brought home the lost. It is also about a boy, who returned years later, to find the dog that saved his family’s life. 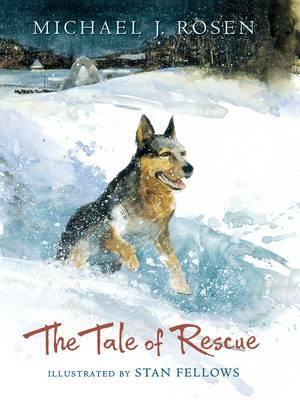 In this divine and inspiring tale of loyalty, Angus the dog has a strong sense of self. He knows his role in life and what he was born for, and follows that given. The characteristics he owns -- dedication, adherence to rules, and a certainty that allows no doubt -- can be seen as human behaviour as well. This is a story of hope and perseverance, which also brings into strong focus, the unique way animals communicate with humans. The stunning illustrations by Stan Fellows add to the beauty of the whole presentation. Produced in hardcover with an exceptional jacket, apart from its textual worth, it is an ideal gift for lovers of working dogs and dog stories, or others with interest in meaningful stories that go straight to the heart.